Brace yourselves, Chicagoland, because the cicadas are back! The Chicago Tribune recently published an article about the upcoming infestation of cicadas (which happen to be in the Arthropod phylum). 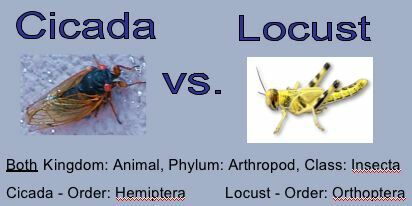 Cicadas are often mistaken for locusts, but they're actually they are related to leafhoppers or aphids. (Watch a video of actual locusts here.) Locusts are grasshoppers that often travel in vast swarms. 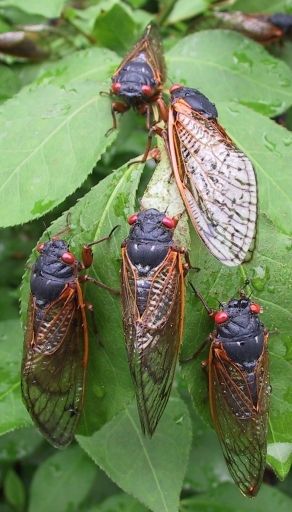 Because periodical cicadas appear in such large numbers, early European settlers in North America connected cicadas to the plague of locusts mentioned in the Bible. 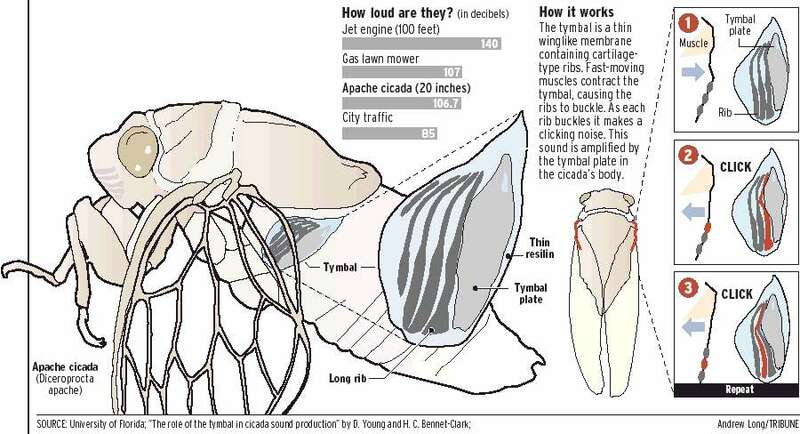 Cicadas are not locusts. Watch an amazing movie on the life cycle of cicadas. There are two main types of cicadas: "annual" cicadas, which are around in small numbers each year, and "periodical" cicadas, which come out in a giant, synchronized mass every 13 or 17 years. I learned that there are believed to be 13 broods of 17-year cicadas in North America. (I also learned you won't find periodical cicadas on any other continent!) The respective 17 and 13 year broods of any one species only overlap once every 221 years, i.e. broods V and XXII emerged synchronously in 1897 and will not do so again until 2118." (source: Gordon's Cicada Page) Check out this great interactive map to learn more about broods and when they might be in your area! The last brood to emerge was Brood X (brood #10), which came up in the spring of 2004 in the eastern US. The group of cicadas that will be seen in Chicago this May are named Brood XIII (or brood #13). The last time they surfaced (if you do a little mental math) was in 1990, when I was a freshman in high school! Hey, to celebrate this historic moment in your middle school lives, you may want to order your Brood XIII T-shirts now! And, it's not very nice, but you can play Swat the Cicada on your computer. Disclaimer: the University of Maryland does not advocate eating cicadas without first consulting with your doctor. While many people do eat cicadas, there is no guarantee that they are safe for every person to eat. As with all foods, it is possible that certain individuals will have allergic reactions to substances within the cicada. Dip them in the beaten egg, roll them in the seasoned flour and then gently sauté until they are golden brown. I couldn't find an e-mail address for you, so I apologize for posting here. If you'd like a full-size shot of those cicadas (suitable for printing -- or displaying really big to gross out your students). I also have video of a walk through a Brood X-infested forest. I could send you a 30-second snippet just so you could hear the incredible racket they make. Lemme know if you're interested. I'm happy to send 'em.